At California Family Fitness, we understand that working out when you have kids can be a challenge. Which is why we made it our mission to provide a safe, fun, and active place for your kids to play while you enjoy your workout. Our philosophy is simple, we want to make being fit fun and entertaining for the entire family. We want our members to enjoy a dynamic and rich fitness experience at the gym and we never want parents to feel guilty about investing in much-needed alone time. So while you try exciting new fitness classes, meet new friends on the gym floor, and get healthier, your kids will be doing the same thing. Our Child Care Staff know how important physical activity is for growing strong healthy bones and muscles. That’s why our staff supervise, participate, and engage with your kids during all activities. 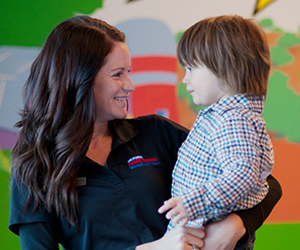 Your kids will feel safe and excited each time they walk through our doors, and our staff is just as excited to see them. We offer both structured and unstructured play time during the day for children from infants to preteen. Our fitness activities are lead by certified staff and your kids will get their exercise in while having a blast at the same time. We also offer rock climbing walls, spray gardens for summer fun, crafts, games, & puzzles. Our facilities also have indoor and outdoor play structures - perfect for climbing, sliding, and swinging. Additionally, we have sports activities including basketball, soccer, and others. There’s a reason why we’ve has been voted best Sacramento Gym on KCRA’s A-list time and again. We’re not just a gym, we want the whole family to experience fitness together which is why we have several gyms with childcare. We value you and your family and want to provide the best experience we can so you can feel great every day. View all our Kidz Klub Amenities or contact a club today for questions.